The Winco PMCD-9R Red Double Fold Menu Cover 9-1/2" x 12" is an attractive and effective way to highlight your menu selections. Designed with a rich red double-stitched border and brass corners, this menu has two pockets that feature four clear 9-1/2" x 12" panels showcasing your multiple menu choices. With a plastic menu cover, you have the ability to design paper menus in a myriad of ways to match your restaurant theme and decor and you can change them as often as you'd like to reflect updated menu choices, price changes and specials. 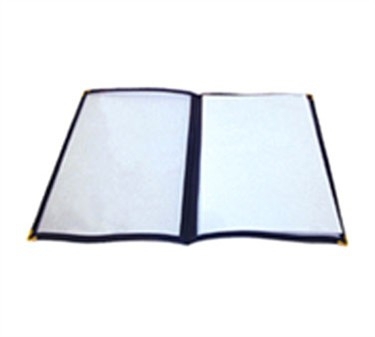 These transparent menu covers offer high visibility and utilize maximum space, they are also simple to keep clean and sanitary for your guests.